When Sun Ce's attack hit, he can do a judgment. If it is a heart, he draws one. If it is a spade, he can select a player within one distance of the original target and hurt them one. 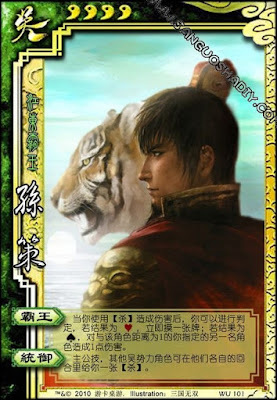 King Ability: Other members of Wu can give Sun Ce one attack during their turn. When Sun Ce's attack hits and the judgment is a spade, he does not have to choose a player to damage. He can perform the judgment even if there is not a player the prober distance from the original target. Other members of Wu can give Sun Ce any form an attack during their turn. This is done face up so all players can see.